Gervaise Heddle, Chief Executive Officer, commented: “We are very pleased by these excellent results which further demonstrate the potential for Havieron to become a multi-commodity, bulk tonnage, underground mining operation of truly significant scale. These excellent gold and copper assay results flesh out the world-class intersection recorded at HAD005 and reveal a new peak copper grade for the system of 12.4% (HAD006). 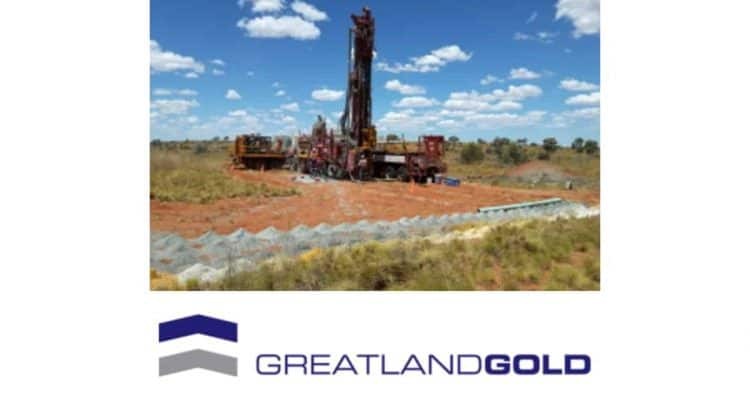 Further to the announcements made on 19 November 2018 and 4 December 2018, Greatland Gold plc (AIM:GGP), the precious and base metals exploration and development company, is delighted to announce excellent laboratory assay results from the Company’s second drill campaign at its 100% owned Havieron licence in the Paterson region of Western Australia. The Company believes that these results significantly extend the known mineralisation intersected in the first drilling campaign and establish new peak grades for copper and cobalt, including 12.38% copper (previously 8.45%) and 4,104ppm cobalt (0.4% cobalt). o 20m at 6.06g/t gold, 0.43% copper and 60ppm cobalt from 616m. o 7.0m at 3.56g/t gold, 0.1% copper and 17ppm cobalt from 538m. · A lower zone of 149m at 0.28g/t gold, 0.11% copper and 51ppm cobalt from 604m. · 15.0m at 2.55g/t gold, 0.62% copper and 244ppm cobalt from 500m. · A lower zone of 74.5m at 0.34g/t gold, 0.43% copper and 356ppm cobalt. · Drill holes HAD006, HAD007 and HAD009 all ended in mineralization. *Gold equivalent values are calculated using a gold price of US$1,200/oz, a copper price of US$2.80/lb and a cobalt price of US$33,000/tonne. Gervaise Heddle, Chief Executive Officer, commented: “We are very pleased by these excellent results which further demonstrate the potential for Havieron to become a multi-commodity, bulk tonnage, underground mining operation of truly significant scale. These excellent gold and copper assay results flesh out the world-class intersection recorded at HAD005 and reveal a new peak copper grade for the system of 12.4% (HAD006). We are also very excited to see significant widths of elevated cobalt (in excess of 500ppm) in three of the reported drill holes (HAD006, HAD008 and HAD009). “Every drill hole from this second campaign intersected mineralisation and, importantly, four of the five drill holes in this campaign (HAD005, HAD006, HAD007 and HAD009) also ended in mineralisation. In particular, HAD006 ended in mineralisation in excess of 1% copper and 750ppm cobalt and HAD009 in excess of 0.5g/t gold, 0.6% copper and 750ppm cobalt. This provides further support to our view that mineralisation continues at depth well below the current limit of drilling, as suggested by the results of recent geophysical modelling. Limited historical drilling was conducted by Newcrest Mining Limited (“Newcrest”) at Havieron during the 1990s and early 2000s where six holes were drilled, all of which intersected significant alteration and gold plus copper anomalism. Thick lower grade zones of gold and copper were intersected by Newcrest and gold grades within these peaked at 15.4g/t and copper to 2.5%. · 21m at 3.79g/t gold and 0.44% copper from 418m (HAD003). The Company’s Paterson project, comprising the Havieron, Black Hills and Paterson Range East licences, is located in the Paterson region of northern Western Australia. The three licences collectively cover more than 385 square kilometres prospective for iron-oxide-copper-gold (“IOCG”) type deposits and Telfer style gold deposits. The Paterson region hosts several large gold and copper deposits such as Telfer and Nifty. The region has been subject to more recent exploration which has outlined several other deposits including Magnum (Au), Calibre (Au), O’Callaghans (W, Cu) and Maroochydore (Cu). Alteration and mineralisation of those targets which have been drill tested at Havieron and Paterson Range East display geophysical affinities with IOCG-type deposits. Examples of these are the large Olympic Dam and Ernest Henry deposits in central and eastern Australia. Initial airborne data outlined the Havieron target as covering approximately 1,000m x 1,000m. Depth to top of target is around 400m with these depths easily achieved with modern drilling equipment. Historically only six drill holes were completed by Newcrest between 1991 and 2003, all of which intersected significant alteration and gold, plus copper anomalism. Thick lower grade zones of gold and copper were intersected and gold grades within these peaked at 15.4g/t and copper to 2.5%. The drill hole spacing was broad and the core of Havieron therefore represented an immediate resource definition drilling target. Following a review of regional geophysical and geochemical data over the Paterson project approximately 50 IOCG-like targets were identified in the broader region, with around half in ground held by Greatland. The setting of these licences is on the western margin of a Proterozoic basin which ranges in depth from less than 100m below surface to more than 400m below surface. Basement rocks of the basin are predominantly calcareous rich sandstones intruded by several late stage granitic bodies exploiting basin margin faults which have also provided a focus for ore fluids. Historically, several of these targets were subject to initial first-pass work and show promise at hosting mineralisation as seen at Havieron. The geophysical signature of these targets is very similar to that at Havieron. Basement rocks do not outcrop and Greatland can deploy modern geophysical and geochemical methods to define targets prior to drill testing. MMI sampling and ground gravity over the Havieron target was completed in late 2017 at an initial sample and station spacing of 200m x 200m. Gravity results confirmed a north west structural trend of basement carbonate sediments which is mirrored by the surface MMI response. Clusters of elevated gold, silver, arsenic, copper and iron in MMI results are proximal the peak co-incident gravity and magnetic response. An elevated MMI response in pathfinder elements (cerium, lanthanum, uranium and lead) to the immediate SE of Havieron suggests primary basement mineralisation may be present along strike in a structural contact for up to 1.5 kilometres. Peak MMI responses over Havieron were 4ppb silver, 70ppb arsenic, 25ppb gold, 834ppb cerium, 710ppb copper, 53ppm iron, 284ppb lanthanum, 860ppb lead and 112 ppb uranium. Elevated pathfinder elements detected by the MMI survey supported the view that Havieron is a fertile system. New 3D geophysical models of the Havieron target were generated in late 2018 and reported to market on 27 November 2018. Combined, the new gravity and magnetic bodies cover approximately 600m x 600m when the outer shells of the bodies are considered. Results of modelling of gravity data outline a large irregular shaped body, some 300m across, from approximately 400m below surface (top of basement) to 1,200m below surface with an overall subvertical attitude. Result of modelling of magnetic data define a discrete elliptical shaped body approximately 450m across that is steeply dipping (subvertical) toward the south east with a depth extent from around 800m below surface to approximately 1,400m below surface (but the body may continue beyond 1,400m as this is the current limit of data resolution). When 3D gravity and magnetic models are compared there is a +500m vertical and +200m lateral offset between the centres of the causative bodies. In April and May of 2018, Greatland carried out its maiden drill campaign at the Havieron target completing four vertical core holes (HAD001-004) for a total of approximately 2,400m of drilling. Greatland’s drill locations were designed to intersect the mineralised system at Havieron near to historical drill holes HAC9101 and HAC9201. Newcrest’s historic drill holes HAC9101 and HAC9201 were vertical and drilled to depths of 533m and 528m respectively. Significant results were returned including 121m at 2.93g/t gold and 0.23% copper from 497m, including 11.5m at 21.23g/t gold and 0.67% copper from 568.5m (HAD001) and 21m @ 3.78g/t gold and 0.44% copper from 418m, including 1m at 29.12g/t gold and 0.4% copper from 428.5m (HAD003). The company re-commenced drilling at Havieron in September 2018 and the first hole of the campaign, HAD005, was sited 200m west of HAD001 and angled at 70 degrees toward grid east. HAD005 penetrated the Permian cover sequence to 459m before immediately entering the mineralised Proterozoic target sequence. HAD005 returned an overall intercept of 275m at 4.77g/t gold and 0.61% copper (approximately 1,580 metre grams gold equivalent) from an upper zone of 118m at 3.08g/t gold and 0.84% copper from 459m, and a lower zone of 157m at 6.04g/t gold and 0.44% copper from 660m (reported to market 19 November 2018), separated by an apparently unmineralised mafic intrusion. Other metals are present in the system including silver to 211g/t, lead to 12% and zinc to 5.9%. Analytical results for HAD006 through HAD009 have now been received and are reported in this announcement. Overall, every hole intersected mineralisation with broad intercepts reported in several holes. HAD006, HAD007 and HAD009 all ended in mineralisation highlighting the depth potential of the system. HAD006 intersected more than 367.1m of mineralisation at 2.0g/t gold equivalent, including 150.5m at 3.5g/t gold equivalent. HAD008 returned 89m at 3.6g/t gold equivalent. In HAD007 gold peaked at 21.75g/t and indicated additional mineralisation several hundred metres further east. HAD009 tested the deeper parts of the system returning significant copper intercepts from approximately 765m downhole to end of hole. Cobalt grades have been consistently elevated throughout the mineralised system and it has been deemed prudent to add cobalt (along with copper) to the gold equivalent calculations. 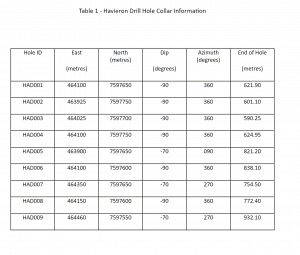 Drill hole collar information and end of hole depths are presented in Table 1. HAD006 was collared 50m south of HAD001 and drilled vertical to track mineralisation as seen in HAD001 and HAD005. HAD006 intersected desert sands and calcrete to 3m then Permian sediments to 424m before entering the Proterozoic target sequence. From 424m to 475m a barren mafic intrusive was intersected. From 475m the hole intersected mineralised brecciated calcareous sandstones to end of hole at 838m. Results included broad intercept of 367.1m at 1.15g/t gold, 0.44% copper and 176ppm cobalt from 471m to 838.1m (eoh), including 150.5m at 2.25g/t gold, 0.67% copper and 224ppm cobalt from 471.5m. Peak gold in HAD006 was 101g/t, peak copper 12.4% and peak cobalt 4,104ppm. Further intercepts are presented in Table 2. HAD007 was sited 250m east of HAD001, angled at 70 degrees toward grid west, and designed to collect structural information on the host rock sequence. HAD007 intersected desert sands and calcrete to 4m then Permian sediments to 467m before entering the Proterozoic target sequence. From 467m to 550m variably silica altered calcareous sandstones were apparent; concentration of visible mineralisation increasing with depth. A barren mafic intrusive was present from 550m to 601m and then from 601m to 754.5m (eoh) silica altered calcareous sandstones were intersected with visible laminated mineralisation interspersed. HAD007 deviated north somewhat and mineralisation was not as well developed as in previous holes but intersected an upper zone of 77m at 0.63g/t gold with 0.14% copper and 42ppm cobalt from 468m, and a lower zone of 149m at 0.28g/t gold, 0.11% copper and 51ppm cobalt from 604m. Peak gold in HAD007 was 21.75g/t, peak copper 2.8% and peak cobalt 1,570ppm. Further intercepts are presented in Table 2. Interestingly, HAD007 intersected mineralisation in the upper parts of the hole demonstrating the presence of mineralisation several hundred metres further east than previously expected. HAD008 was collared 50m east and 50m south of HAD001 and was designed to track mineralisation as seen in HAD001 and HAD005, and to test the attitude of the barren mafic intrusive. The hole was drilled vertical but deviated to the north. HAD008 intersected desert sand and calcrete to 5m then Permian sediments to 426m before entering the Proterozoic target sequence. From 426m to 516m mineralised brecciated calcareous sandstones were apparent; concentration of mineralisation increasing with depth. Then from 516 to 772.4m (eoh) a barren mafic intrusive was intersected. Results include a broad intercept of 89m at 1.97g/t gold, 0.8% copper and 362ppm cobalt. Peak gold in HAD008 was 93.2g/t, peak copper 6.1% and peak cobalt 2,763ppm. Further intercepts are presented in Table 2. HAD009 was collared 350m east and 100m south of HAD001 and was designed to intersect mineralisation at depth as seen in HAD005 and to test depth extensions of mineralisation as defined by geophysical models. HAD009 was angled at 70 degrees and drilled toward grid west. The hole intersected desert sand and calcrete to 4m then Permian sediments to 460m before entering the Proterozoic target sequence. From 460m to 667m laminated calcareous sandstones were intersected. From 667m to 750m strongly fractured to brecciated carbonate and silica altered sandstones were present with mineralisation increasing with depth. From 750m to 806m brecciated mineralised calcareous sandstones were present. From 806m to 844m a barren mafic intrusive was intersected. Then from 844m to 932.1m (eoh) strongly fractured and brecciated mineralised silica altered calcareous sandstones were present. Mineralisation was to end of hole. Results from HAD009 returned an upper intercept of 117m at 0.16% g/t gold, 0.11% copper and 113ppm cobalt from 689m, and a lower intercept of 74.5m at 0.34g/t gold, 0.43% copper and 356ppm cobalt. Peak gold in HAD009 was 4.0g/t, peak copper 2.77% and peak cobalt 1427ppm. Further intercepts are presented in Table 2. Increasing intensity of sulphide mineralisation (with gold and copper and cobalt) in the base of HAD009 is coincident with the top of the 3D modelled magnetic body suggesting mineralisation continues at depth to at least 1,400m below surface.